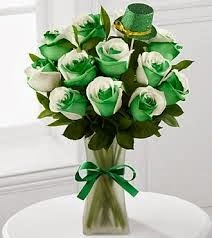 Have a marvellous Monday and Happy St Patrick's Day to you all and may luck be with you. St Patrick's Day to all! May you have the luck of the Irish. You are so sweet, Dexter. We hope you all have a very Happy St. Patrick's Day! What beautiful flowers! Wishing you a very happy St. Patrick's Day! Love, O'Crepes. Sweetest D, fear de mo chroí (man of my heart), I'm sharing your purrs today while I wish you a wonderful St. Patrick's Day! Le gra' go deo, your 'lil bean. purrs a thabhairt duit, mo oráiste banphrionsa! What a romantic dude you are, Dexter! Happy St. Catrick's Day to you and the whole family! Dexter, you are such a romantic! Happy St. Patrick's Day!